Aireon’s fifth successful launch and the deployment of the company’s space-based Automatic Dependent Surveillance-Broadcast (ADS-B) payloads, hosted by the Iridium® NEXT satellite constellation, succeeded at 7:13:51 AM PDT (14:13:51 UTC), as a flight-proven SpaceX Falcon 9 rocket lifted off from Vandenberg Air Force Base in California — this brings the total number of Aireon payloads on orbit to 50. When the Aireon payloads from the fifth launch come online, the system will have nearly global coverage with 15-minute or better update intervals.This signifies optimal timing for airlines to begin testing the capabilities of space-based ADS-B. This will assist airlines with meeting the International Civil Aviation Organization (ICAO) and European Aviation Safety Agency (EASA) regulations that require aircraft be equipped with an aircraft tracking system for those flights not tracked by air traffic control by the end of 2018. With the Aireon service and access to the space-based ADS-B data, airlines can meet this directive set by regulators and safety organizations. FlightAware and Aireon have worked together to create GlobalBeacon, a first-of-its-kind product. 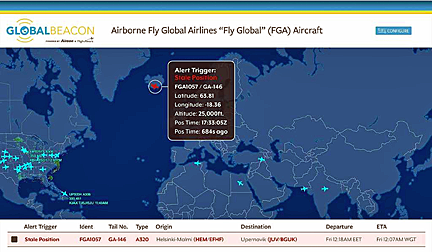 GlobalBeacon combines FlightAware’s data processing platform and web-interface with Aireon’s space-based ADS-B data for a cost-effective, easy to deploy solution to help meet the ICAO Global Aeronautical Distress Safety System (GADSS) standards. The Aireon system is hosted on the Iridium NEXT satellite constellation. A total of 81 Iridium NEXT satellites are being built, a ll of which will have the Aireon payload onboard.Currently, 75 satellites are planned to be deployed, with nine serving as on orbit spares and the remaining six as ground spares. The constellation is planned for completion during 2018. In addition to GlobalBeacon, FlightAware is delivering the data through services that are already commonly used by airlines and industry leading service providers, such as SITAONAIR. Don Thoma, the CEO of Aireon, said that the company is more than two-thirds of the way there. And as Aireon gets closer to a fully operational system, thorough testing and validation is now underway with customers and partners. Aireon is working closely with ANSPs and partners such as FlightAware to ensure airlines have early access to this global data, ahead of regulations and requirements. Aireon will be able to help airlines meet these mandates, and upon completion of the constellation, update rates of a few seconds will be the service standard around the world. Dominique El Bez, Vice President, Product and Strategy, SITAONAIR, added that the firm's partnership with FlightAware means that any airline using AIRCOM® FlightTracker will have at its fingertips a dynamic tool providing an overview of the exact position, speed and altitude of its airborne fleet. Most critically, the coverage will now be 100 percent,even over oceanic, remote and polar areas. By receiving once-per-minute positions from Aireon’s network of space-based ADS-B receivers, airlines will exceed the ICAO GADSS upcoming 15-minute recommendation.